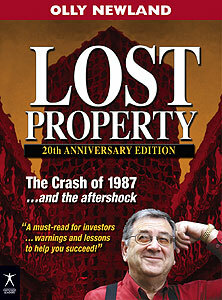 The crash of 1987 still reverberates in the psyche of many investors. Those turbulent days influence investment decisions and actions today, but not everybody fully understands their impact. It wasn’t just the sharemarket that was affected – the crisis in business and lender confidence pulled the booming property market off its tracks. Mortgagee auctions and forced sales, bankruptcies and prosecutions followed as many formerly respected business figures fell from grace – breaking the faith of investors all over the world. Lost Property is a searingly honest insider’s account of the build-up and the let-down, with its brutal aftermath. Read this book to learn what happened during the boom and the crash, how they came about and why. Olly Newland’s first-hand narrative is full of insights and parallels which today’s investor would be wise to consider. Ignore these lessons at your peril! “Many people remember with a shudder the massive stockmarket crash around the world in 1987. In New Zealand, as in many countries, it came on the back of an unprecedented share and property boom when huge sums of money could be made for the asking. One of the stars of the New Zealand scene was Olly Newland, founder of Landmark and wheeler-dealer supreme. Banks queued at his door to lend him money, the media for advice and comment, and he was in demand as a speaker to investor groups. Then, beginning in New York, the market suddenly crashed. Here, Olly Newland gives an insider’s view of the build-up and the let-down — and lays the blame firmly at the doors of the banks and the government. Readers may never trust either again. Also available while stocks last: Limited edition of 200 numbered copies personally signed by Olly Newland. 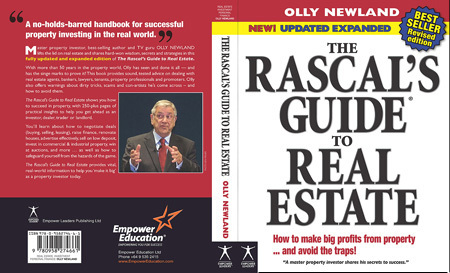 Olly is one of this country’s foremost property investors with more than 50 years experience in the property market (during booms and busts). 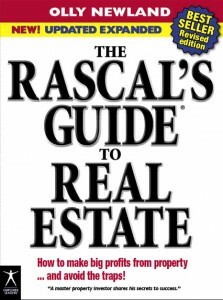 The Rascal’s Guide to Real Estate is a valuable resource for TODAY’s investors and home owners, providing sound, tested advice — as well as a rollicking good read! … and more! AVAILABLE NOW. Order from Empower Education.